Lillian K. Hoover is a Charter Member of the 1860 Society, a prestigious group who is leaving legacy gifts through their estate plans to the LSU Foundation on behalf of the college or area of their choice. These loyal friends and alumni realize that LSU's next century of success depends on their legacy today. With Lillian, there was never any doubt that she wanted to honor her husband, Jimmie, because of his devotion to his students. She has created a scholarship in his honor and plans to enhance this scholarship with her estate gift. Mr. Hoover was a well respected man, not only by his peers in the Library Associations, but also by the thousands of students he assisted as Director of the Government Documents department at the LSU Library from 1967 to 1984. But, as Mrs. Hoover stated, "He was never too busy to visit with the students either at school or their home." He mentored them about curriculum, student life on campus, and followed their careers after graduation. After his retirement from LSU, John Richard, then head of the East Baton Rouge Parish Library System, convinced Jimmie to work for him at the Downtown Library. Once again service to the library patrons was the driving force of his employment. At his death, Lillian established the Jimmie Hoover Scholarship in the School of Library and Information Sciences. She felt it was the most appropriate way to honor her husband. She keeps in touch with her recipients and attends the school's banquet every year. Many have confided that they could not have gone to Graduate School without the aid of this scholarship. Although Jimmie is no longer with us, his memory lives on through this scholarship. 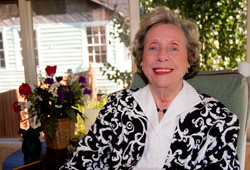 The LSU Foundation is proud to name Lillian Hoover as this year's Leave a Legacy Award.